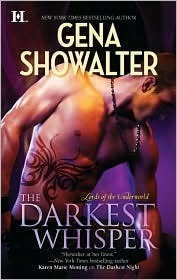 During my break in Scotland, I read three books in Gena Showalter’s Lords of the Underworld series. Over the past two weeks I have posted my four star review of The Darkest Kiss and my five star review of The Darkest Pleasure, and this week I’m posting my review of The Darkest Whisper! He is the keeper of Doubt and his entire worldâ€™s about to be rocked. Bound by the demon of doubt, Sabin unintentionally destroys even the most confident of lovers. So the immortal warrior spends his time on the battlefield instead of the bedroom, victory his only concernâ€¦until he meets Gwendolyn the Timid. One taste of the beautiful redhead, and he craves more. The Darkest Whisper, the fourth book in Gena Showalterâ€™s Lords of the Underworld series, starts off with a bang that soon fades as the book progresses. The plot wasnâ€™t amazing in this one, mainly focusing on the romance blossoming between the hero, Sabin, the leader of the Greece Lords and keeper of Doubt, and Gwen, a young Harpy female. There are a few fights thrown in to spice things up a bit, but they all felt a little convenient to me. There was no real hints that danger was coming or the enemy was going to launch a full-scale attack. Everything was pretty much fine one moment and total pandemonium the next. It did leave me feeling that they were tossed in there because the author felt there needed to be something happening in the book other than the romance. We learn a few new things about the world and the overall plot arc in the book though, but it isnâ€™t Sabin or Gwen who learn them. Theyâ€™re mostly out of action dealing with each other. I think I would have preferred it if the leading couple had been more involved with the plot. Most of the time, Sabin and Gwen were busy training together or generally resisting their desire for each other, rather than moving the plot along, flimsy as it was. The Darkest Whisper was more about the romance than anything. The ending was fairly unbelievable and actually came close to ruining this book for me. Gwenâ€™s decision would have driven the Lords to totally butcher her and I doubt they would have listened to Sabin and given her the choice when securing their fate and future is within their reach. It just seemed out of character for all of the immortal warriors that they would let it go down that way. Also, the epilogue was dire and extremely cheesy, and utterly pointless. It sort of made me cringe. However, Sabin was delicious and I really liked Gwen, and their romance was one worth reading. Since Sabin is the keeper of Doubt, he has a tendency to drive women to lose all confidence in themselves and eventually commit suicide. He doesnâ€™t have a great track record with the ladies, so has kept clear of them, until he finds Gwen locked in a glass cage in a Hunter lab in Egypt. Saving her becomes priority one for the man who is normally so focused on war and fighting, willing to do whatever it takes to win. Itâ€™s that side of him that makes Gwen cautious and unwilling to fall for him, even when she canâ€™t stop herself from desiring him. Her Harpy side delights in the presence of such a strong handsome man and sheâ€™s fairly smitten from the moment he saves her. Sabin uses the excuse that heâ€™s keeping her around because he wants to make timid little Gwen into a weapon, harnessing her Harpy side and training her to unleash it at will. As the story progresses though, he comes to admit that heâ€™s keeping her around because as far as heâ€™s concerned, she belongs to him now and he wonâ€™t let her go. He also realises that he canâ€™t use her in the manner he first wanted to, and that sheâ€™s changing him and smoothing out his rough edges. Gwen was a brilliant heroine too. I always enjoy it when we get to witness a heroine coming into her own. She goes from being afraid of her Harpy side and pretty much everything around her, scared that sheâ€™ll lose control and harm people she cares about, to being a strong confident woman in control of herself and her destiny, and determined to bring Sabin to his knees. I love how possessive she became of him, her Harpy side taking the reins whenever someone dared to just look at him the wrong way. Read this book for the romance and just take the randomly thrown in bit of plot at the end as a bonus. It was great that the series has taken a leap forward though, the revelations coming thick and fast now, but some parts of it just didnâ€™t fit with what we know of the Lords and how they work and react to things. I would still recommend it though. I want to give it a four because I loved the romance side of things, but I canâ€™t get passed the fact that it just sucked a little at the end, so itâ€™s going to have to receive a three from me. Itâ€™s really a 3.5, and I know I normally bring those up to a four, but I just canâ€™t do it with this one without my stomach turning.